Historic preservation is a potentially powerful contributor to the economic engine of New Jersey. Each $1 million spent on non-residential historic rehabilitation creates two jobs more than the same money spent on new construction, according to a 1998 study commissioned by the New Jersey Historic Trust and conducted by the Center for Urban Policy Research at Rutgers. That same $1 million rehabilitation also generates $79,000 more in income, $13,000 more in taxes and $111,000 more in wealth than new construction. The increased income and wealth result not only from money spent on the actual labor, materials, and supporting services involved in the rehabilitation, but also from property appreciation and tourism. Preservation pours more than half a billion dollars into the state’s economy each year, including $123 million in improving historic buildings, $432 million in heritage tourism spending, and $25 million in spending by historic sites and organizations. Stopping growth in the wrong places gets you only halfway to smart growth. Smart growth success also means helping growth happen in the right places, including by preserving what we already have. A tax incentive to encourage preservation is now moving in the New Jersey Assembly. The Historic Property Reinvestment Act (A-781/S-1416) provides homeowners and corporations with an economic incentive to help revitalize older neighborhoods and re-use historic structures by providing a state tax credit for their rehabilitation. The bill would allow a credit of 25 percent of the costs of a completed rehabilitation. On October 18, the bill was passed unanimously by the Assembly Environment & Solid Waste Committee, and was sent to the Budget & Appropriations Committee for further review. The companion Senate bill is also awaiting action in the Senate Budget & Appropriations Committee. The state of Maryland offers a similar tax credit program that has been enormously successful as both a historic preservation tool and an economic development tool. It has generated approximately $400 million in private investment for completed projects certified since 1997, and generates an average rate of return to the state of approximately $1.02 for each dollar of the tax credit amount the first year the tax credit is taken, and an average of $3.31 on the dollar for years two through five. The Historic Property Reinvestment Act will help restore properties and property values in blighted neighborhoods, increase local tax revenues, rebuild existing communities, reduce the use of open lands, and generate tax revenues for our cash-strapped state. 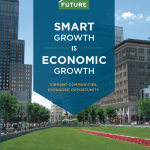 Growth that rebuilds, reuses, and saves money is what smart growth is all about.